Gammon is an ideal joint for relaxed entertaining at Easter, as it requires the minimum of preparation, is easy to serve and yet looks very impressive. This recipe can be made using either an unsmoked gammon joint or, for a change, why not try smoked gammon. The flavour of the cider and the fruit complements either joint extremely well and gives a deliciously moist result. Place the gammon in a large saucepan and add the cider, reserving 3 tbsp. Cover and simmer for 1 hour then remove the gammon from the pan. Mix together the apples, pears and cherries with 2 tbsp of the honey and the reserved cider. 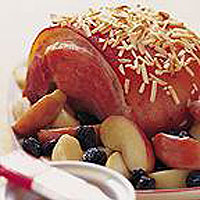 Arrange the fruit mixture in a roasting dish and add the gammon joint. Brush the gammon joint with the remaining honey and sprinkle with the almonds. Place in a preheated oven 180°C, gas mark 4 for 40-50 minutes, or until the gammon is thoroughly cooked. Turn the fruit occasionally. Loosely cover with foil if the joint becomes too brown. Allow to stand for 10 minutes before carving into slices. Serve the gammon and fruit with stir-fried green vegetables and boiled baby new potatoes. Substitute maple syrup for honey. This recipe was first published in April 2000.